So, list in hand I hit the sale aisle and this is what I got. 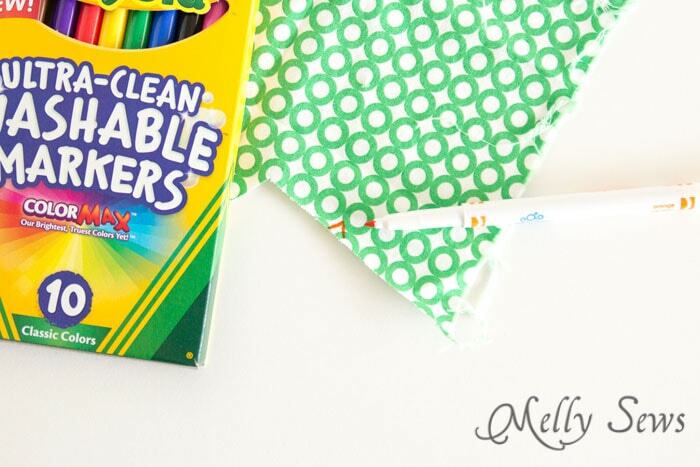 First – washable markers. These work pretty well to mark fabric and wash out. And in a pinch, hand them over to a kid and buy yourself some time to finish a project. 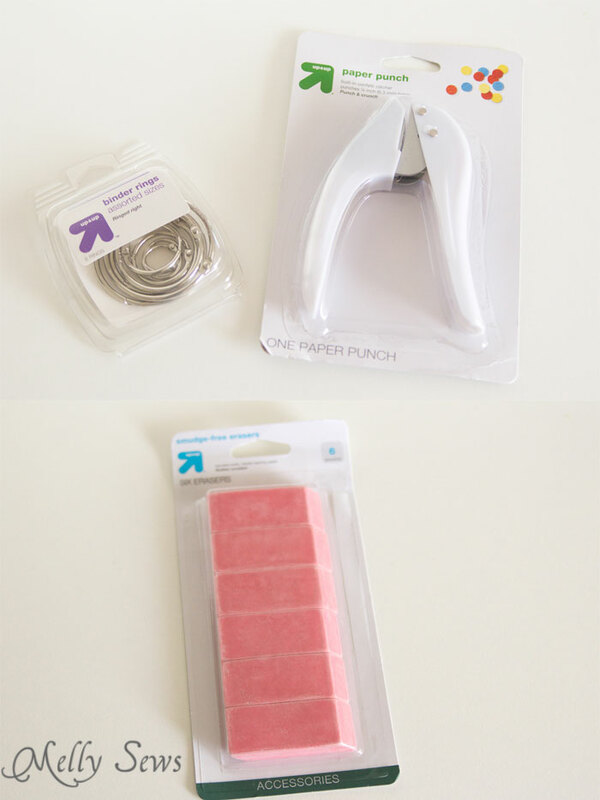 Hole punch and binder rings – these are great for hanging pattern storage. You can also use them to organize swatches to take to the fabric store so they don’t get crumpled and lost in the bottom of your purse. Erasers. Besides using the for drafting, you can carve them into stamps for fabric printing. Glue Sticks. For gluing PDF patterns. Or temporarily holding fabric together. If you get the washable kind, you can even sew with it in place instead of pinning. Though I wouldn’t do that with expensive fabric. 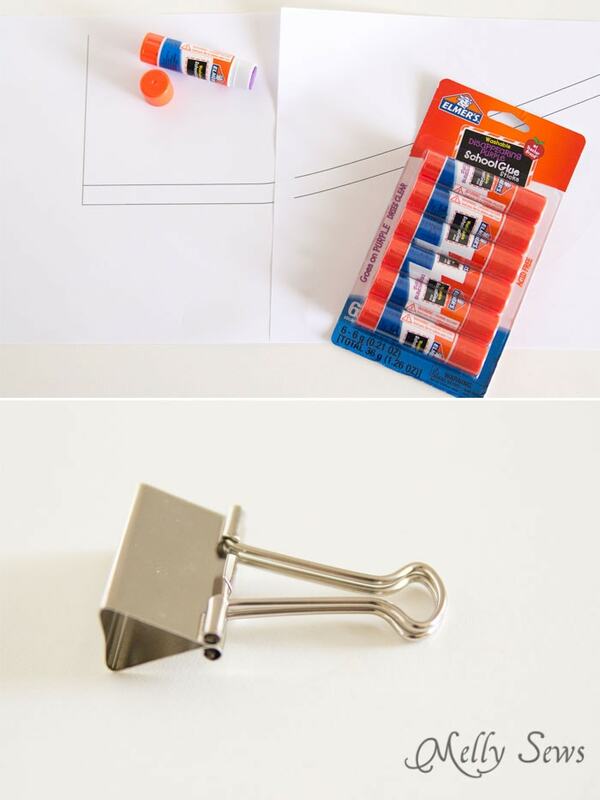 Binder clips. Also good for hanging pattern storage. And holding leather or vinyl together, or any other fabric that can’t be pinned. Compass. Useful for adding seam allowances. And making circles. You can use a protractor to draft curves. 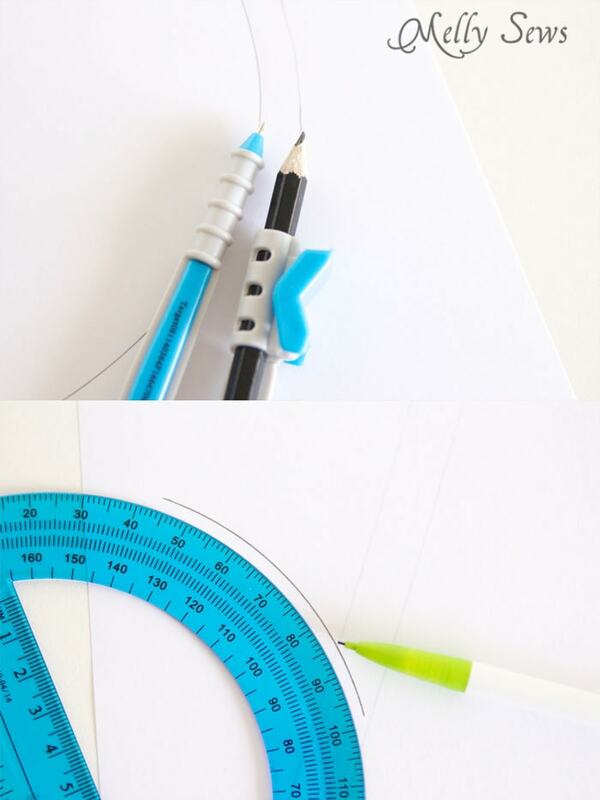 I looked for (but couldn’t find) a clear plastic ruler – these are useful in all kinds of ways in drafting, as are flexible bending rulers. And finally – posterboard. This works great instead of tagboard for slopers, and also works nicely as a photo backdrop for blog tutorial photos. 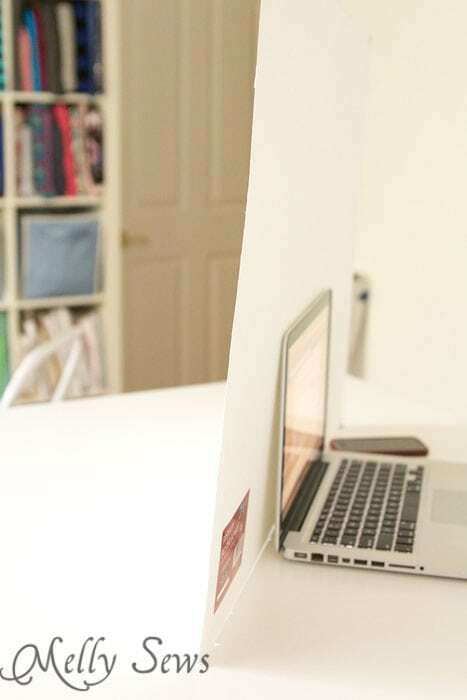 Sometimes propped up against your laptop to act as a standing backdrop, too. 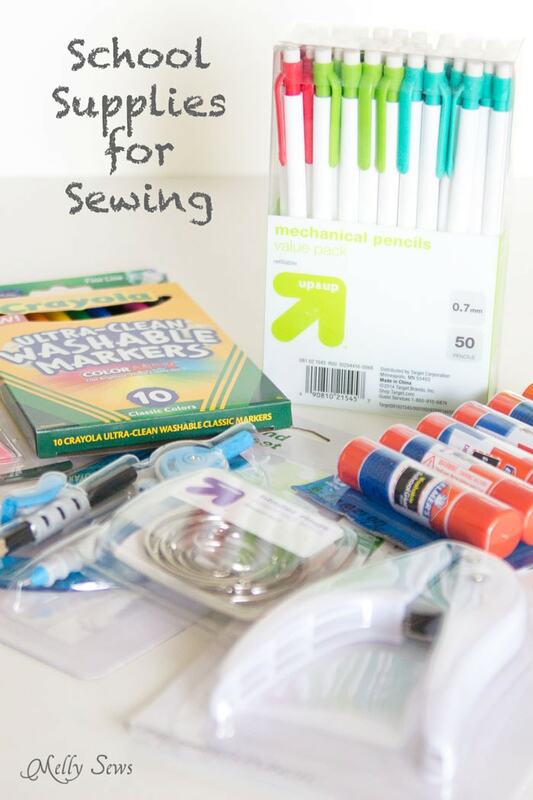 So there you have it – a whole bunch of school supplies for sewing – now go stock up! Great suggestions! 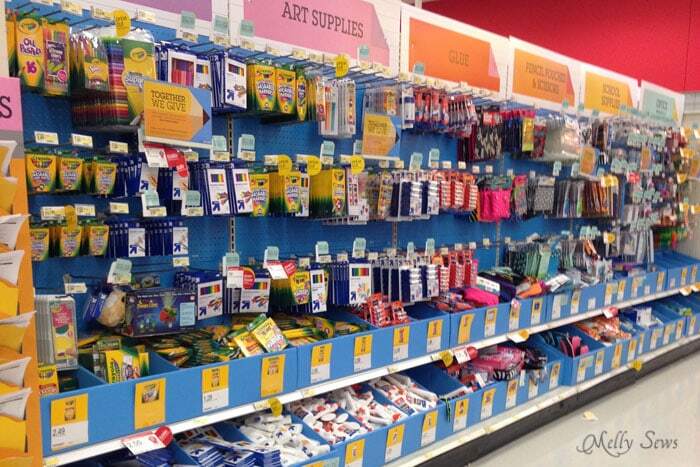 I may have to go grab a few more things at the store! Wow. 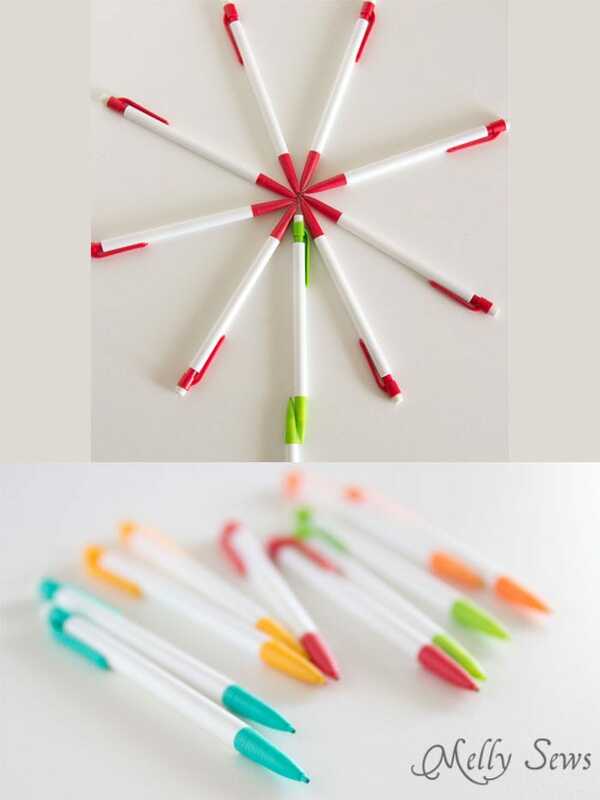 Washable markers. Duh. I have a hundred around the house, and yet I am constantly frustrated by my lousy Mark-B-Gone pen that never shows up on anything. THANK YOU for this revelation! Pilot Frixion pens. These are great for marking fabric. Whenyou are done, just run an iron over the mark and it will magically disappear. but still be careful while using them, when in cold weather the ink reappears. I stock up on binders, tab dividers and clear plastic binder pockets. When I download an electronic pattern ( or an in the hoop embroidery design) and the instructions, I immediately place a copy of the pattern in the plastic pocket, label the tab and add the instructions. Everything in one place. I have several 3 inch binders filled with patterns and instructions. Frixion erasable pens are even better for fabric marking (or pattern tracing). They erase with the heat of your iron! OMG compass for seam allowances. Brilliant! 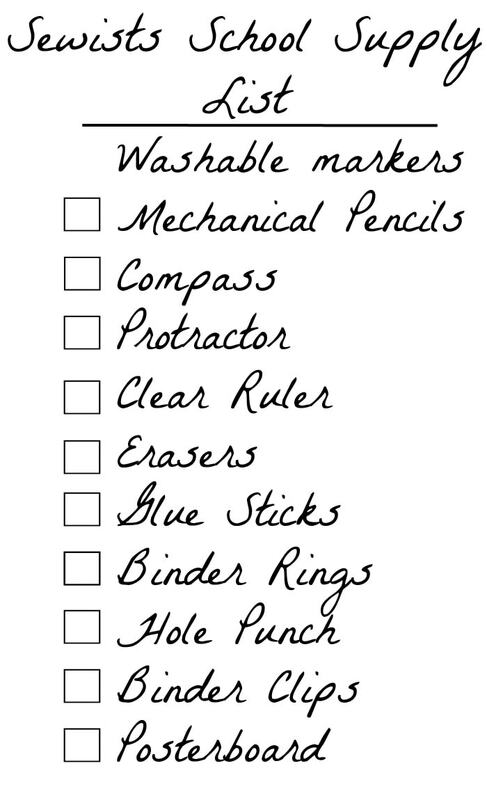 I had heard about using kids washable markers but never thought about these other school supplies. Thanks for the ideas! I agree, this is around the time I stock up on many things too. And they’re always so cheery colors too which is fun while you are creating.